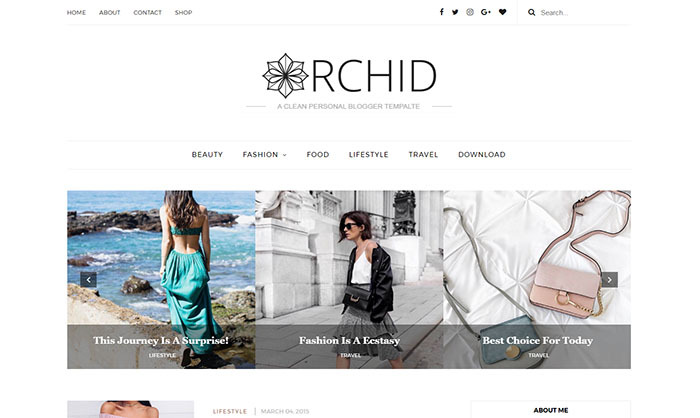 Orchid Blogger Template is one of the best and awesome theme that’s specially crafted for Fashion, Beauty and Personal blogs. If you own a blog where you daily share something about your life then this is one of the ideal choice for you. The design of this template has carefully designed by adding some advanced features in it. It comes with highly SEO Optimized design. So you don’t need to worry about the on page SEO of your blog. The another great feature of using orchid blogger template is that. It has beautiful slider right below navigation bar that can be used to add your most popular posts. You can display your most interesting posts in slider section. So your readers can easily find them right from homepage section of your template. The orchid blogger template also has beautiful header and navigation bar. You can display your blog logo in the head and link your tags or most important pages in the navigation bar. As you know that many people browse the web through mobile devices. So if someone owns a device like a smartphone or a tablet then. They can easily browse your website from different places around the world. It also has very beautiful social media following icons in the top right that you can use to links your social media profiles. So your readers can like and follow you on most popular social media platforms.